On the day we set out for Vaison-la-Romaine, everything started out terribly. 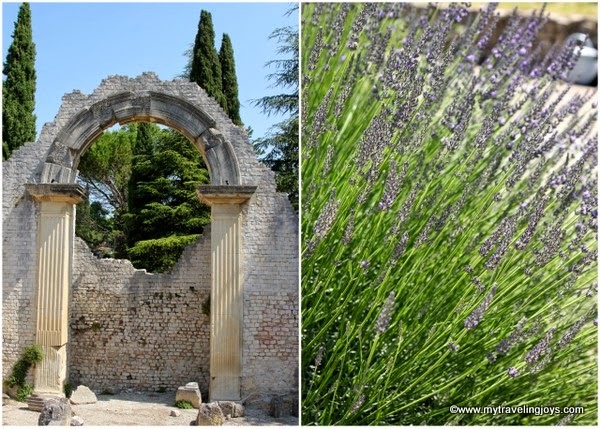 We skipped breakfast and hoped to find something in this busy Provençal town of 6,200 people. We got lost. We tried to find parking. I tried to follow the GPS and direct hubby around the crowded, narrow streets. We crossed over the historic, single-arched, Roman bridge that spans over the Ouvèze river and is still in use. Difficult to enjoy historic sites when everyone is angry! Jason was angry. I was angry, and our grandparents were hungry and annoyed too. 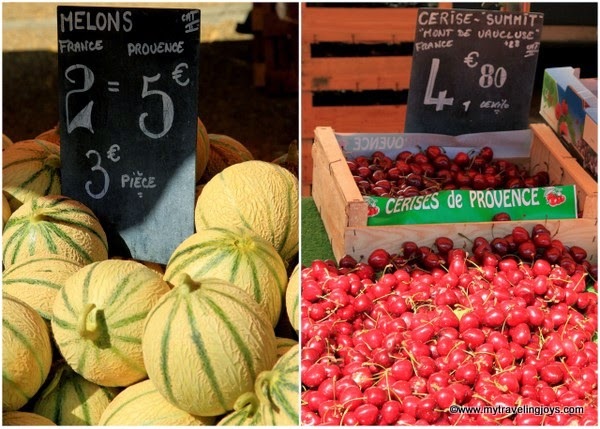 Tuesday was market day in Vaison-la-Romaine, and the town was already packed before 10 a.m. Jason and I quickly realized that we would not be walking around this market very easily, especially with our grandparents. So we set out to meet up with my blogging friend, Barbara of Cuisine de Provence, nearby. Barbara and I had met during one of her trips to Istanbul where we both connected with Claudia of A Seasonal Cook in Turkey. Blogging really is a small world once you start making connections. During the busy season, Barbara teaches cooking classes in her home three to four times a week! She’s even ranked as the town’s number two attraction on Tripadvisor! I was thrilled she had time to take me around the market and then prepare lunch for us. Though everyone was still a bit cranky, I left hubby and the grandparents with Barbara’s kind husband, Robert, and then the two of us returned to the market. We wouldn’t be gone long. Vaison-la-Romaine is picturesque with its winding streets and ancient Roman ruins that seem to sprout up everywhere you turn. Oops, I just bumped into a 6,000-seat Roman Theater. Oh, and there’s some marble columns, excavated houses and baths over there. I’d love to return here and explore some more since we didn’t have time during this trip. While navigating the busy streets like a pro, Barbara gave me a whirlwind tour through the town’s Tuesday market. 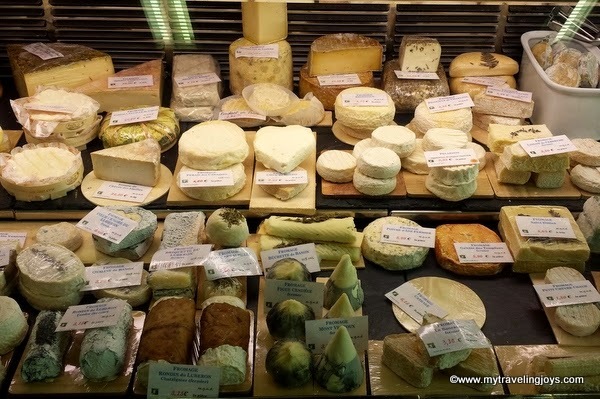 The market had many similar stalls as the one we had visited in L’Isle sur la Sorgue two days earlier. That wasn’t a surprise given the two towns are only about an hour apart. Still, I love a good market, and I was happy to be visiting this one with a local! Several years ago, Barbara and her husband decided to buy a house and retire in the Provençal hills and that’s where they have been living ever since. Now, Barbara teaches the cooking classes in their home while her husband has time to golf. During the off-season, they are able to travel around the world. At the market, we popped into a colorful patisserie called Peyrerol where I ended up buying a box of delicious French macaroons. I also almost bought a caramel beurre sale ice cream cone! Neither of us needed much as Barbara had the lunch pretty much prepared, and we still had leftover market supplies from Sunday. I did buy two jars of lavender honey and a pretty Provençal tablecloth from a stall that Barbara recommended. Now, it was time to head home and eat! Our first course was a chilled, roasted red pepper soup along with glasses of French rosé. Both were welcome respites from the day’s hot temperature. And yes, ice cubes are plentifully used when drinking rosé! Also, Grandma liked the soup so much that she even asked Barbara for the recipe! 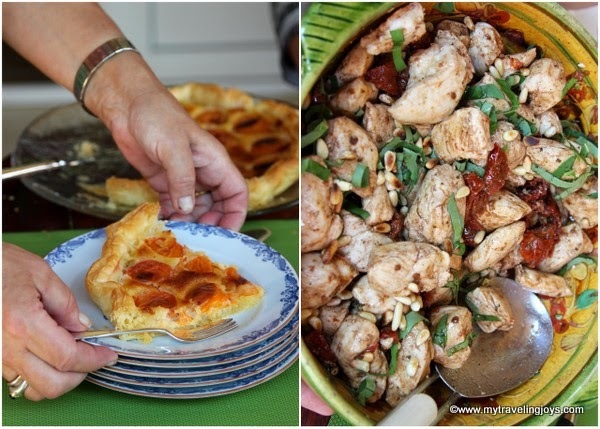 Our second course was a chicken dish cooked with local sundried tomatoes, basil and toasted pine nuts, followed by a rustic apricot tart. Everything was delicious and featured seasonal ingredients, and even the grandparents were finally happy! The busy market really would’ve been too much walking for them. 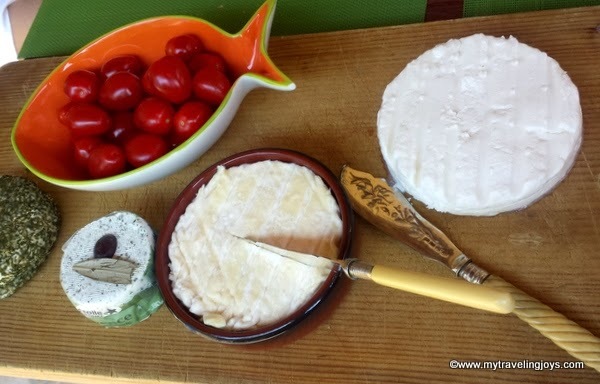 The six of us, four of whom were expats, had plenty of stories to share over our French cheese course. I even had a coveted look at Barbara’s vast pottery collection and told hubby that I could stand to collect much more! Though the day started off badly, I’m very thankful we had a happy ending in Vaison-la-Romaine thanks to Barbara and her husband! What a lovely surprise to find this great post!! I'm relieved that everything all worked out just fine in the end - how great to go around with Barbara! Isn't their place fantastic? 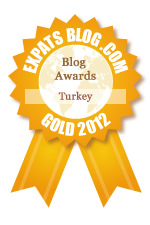 We had such a great visit with them too, and they've been back to Istanbul as well. I didn't realise B taught as much as that: now, there's an act to follow!! @Claudia, yes, we loved visiting Barbara and going to the market with her! She was so welcoming. If only we had had more time to actually do a cooking class together! Hopefully, there will be another time.